ASLO Meeting Includes Teacher EXPO and Tours on the R/V Pelican – Register Now! The Association for the Sciences of Limnology and Oceanography (ASLO) invites educators to register for a Teacher EXPO that takes place on February 21, 2013 at the Ernest N. Morial Convention Center in New Orleans. Registration is required and is free for teachers. Teachers who attend the EXPO will have the opportunity to listen to four mini-lectures on Freshwater and Marine Science topics, participate in guided marine science activities, and tour the 116 foot Oceanographic Research Vessel Pelican. oceanographic instrumentation and collection devices. Please contact Ms. Murt Conover, 985-851-2860, mconover@lumcon.edu, by February 8, to reserve space for a K-12 school group. Individual members of the public, including students, their parents, scout groups and science clubs are welcome to visit and tour the research vessel from 2:30-7:00 pm that day. ASLO attendees are welcome throughout the day. The Louisiana Universities Marine Consortium (LUMCON) owns the R/V Pelican and operates it out of Cocodrie, LA as a member of the national academic fleet (UNOLS). 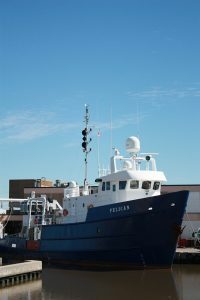 The coastal vessel is outfitted with four laboratories with capacity to take 14 scientists to sea for up to three weeks for a variety of oceanographic research missions along the continental shelf in the Gulf of Mexico, Caribbean, and the Western Atlantic. Scientists with five Research Consortia funded with grants from the Gulf of Mexico Research Initiative are actively using the R/V Pelican for their oil-spill-related research expeditions, including the Coastal Waters Consortium based at LUMCON. Please stop by the R/V Pelican to visit with scientists and tour this remarkable research vessel!